Anyone who's been on here for a little bit knows how much I Iove the Elemental tribe and theme. From the perspective of someone who was still just starting to get their feet wet on the ladder when Un'Goro hit, it was nice to be able to put together a deck centered around minions that synergize nicely while not having to worry about every decent inclusion being Rare or mostly Epic. Thematically, Shaman was my go-to class in WoW so when Eles got their own tribe tag in Un'Goro I was like, "this is gonna be my main jam from here on out!" One of the big things I see mentioned (and experience myself) that holds Elemental decks back is the generally slow nature of them early in the match. Even with minions like Tar Creeper being cheap defensive options, its often more effective to push a more aggressive strategy during those early turns. To that end, we usually wind up either supplementing with class/neutral cards and saving Ele synergies for later, or resigning to the "turtle up" strategy until we can turn around after turn 5/6 and start pushing more aggressively. Sometimes it's best for something to not be at the very top of the food chain so as to avoid any risk of nerfs, but I'm curious if there are any plans to continue developing the Elemental tribe and patch what most would consider the weaknesses that hold it back from higher competitive viability, or is it going to cruise a along as a more middle-of-the-road tribe that's easily accessible, but bears no real risk of becoming a backbone to any powerhouse decks? Maybe it's designed with a more supplementary application in mind rather than being the central theme of any decks that were dreamed up during design? Frost Lich Jaina was definitely a massive boon to Elemental Mage and exactly the kind of card I was hoping to get, so I have hopes that the tribe will continue to be on your radar when developing future expansions. To my fellow players, what are some ideas YOU would like to see added to Elementals? I know minions that boost other minions' stats have been popular (and in some cases, downright hated) lately, but I wouldn't mind seeing a 2 or 3 cost Ele that boosted other Elementals health and/or attack. The tribal ties would help prevent it from being just another inclusion in any and every zoo deck, and could promote some more early game viability to start off matches a bit stronger. We're pretty happy with the state of Elementals right now. Shaman in Un'Goro and Mage in KFT feel like they have dipped in and out of the meta. In terms of standard rotation, Elementals will be around for quite some time. When the first expansion of the new year comes around a lot of decks will lose a bunch of their cards while elemental decks lose very little. It's something we have to be aware of when adding new tools for that archetype. 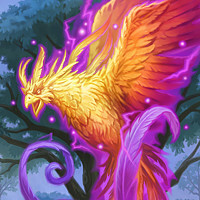 That said, we are big fans of the deck and want to keep adding Elementals here and there to make it feel fresh. Do you plan on continuing to rotate which glass gets Elemental goodies as the expansions continue, or is that reaching a bit too far? Unless we do another heavily elemental themed expansion, it's likely they will stay as a Mage/Shaman thing. In order to make the deck work in another class I think we would have to dedicate more cards to the archetype than we would feel comfortable with unless Elementals were a core theme of that set.